Feel inspired, angry, and polemical about a topic which has the potential to ignite us all. Young Poets Network have teamed up with End Hunger UK to call for poetic responses to the scandal of UK hunger. This challenge is now closed: read the winners in the anthology below. 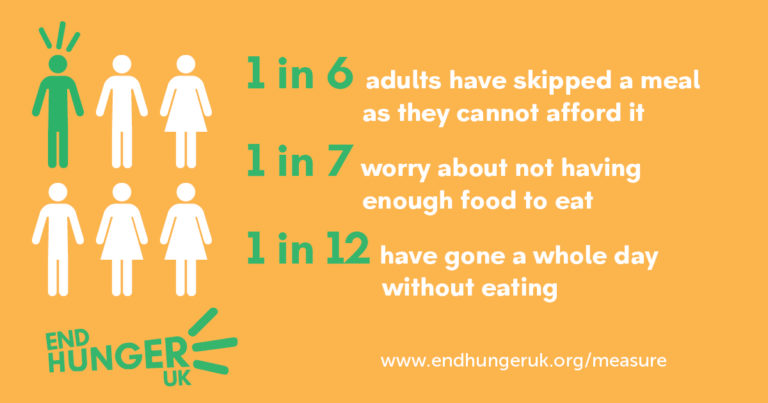 Did you know that 14 million people in the UK today live in poverty with 1 in 7 people worrying about not having enough food to eat? With more and more people relying on food banks and charities’ help to eat, the situation is reaching breaking point. It is ridiculous that the fifth largest economy in the world is the second most food insecure country in Europe, only behind Albania. We want to hear your poems in response to this crisis. We want thoughtful poems, protest poems, portrait poems, ballads, spoken word – we’re looking for all poetic responses to the scandal of UK Hunger, penned by young people aged 11-25 based in the UK. Selected entries will be published and included in a UK-wide touring exhibition as part of the End Hunger UK campaign, with the chance to make real change. Your poems, as part of this exhibition, will alert MPs to the scale of this country’s hunger crisis. We can’t wait to see what you come up with. I have lost a lot of weight. My survival tactic is hot lemon and water and sugar because it breaks the wind down and stops the hunger pangs. Sometimes I feel so sick. When I get paid I can eat for the first two weeks. I cook from scratch a lot. I eat chicken and rice, spaghetti bolognese, I eat tins of sardines, frozen mixed veg and stuff, Iceland pizza. And when I’m out of money, then I go to my neighbour. This is where the food banks have to come in. I’ve got one bag of chips and two loaves of bread and that’s me ‘til next Wednesday [six days away]. I’m now up to my limit with food bank vouchers as you can only get four. 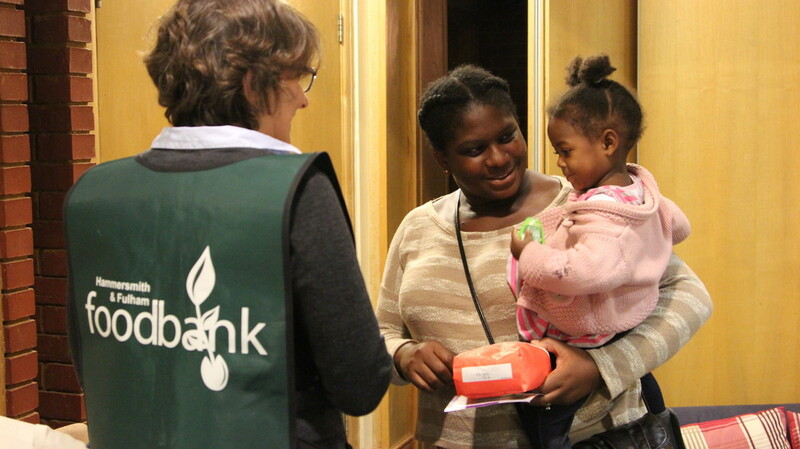 Kamika and her daughter with Hammersmith and Fulham food bank manager. The use of emergency food aid in the UK, particularly in the form of food banks, has dramatically increased over the last decade. At least half a million people have had to rely on food handouts to feed themselves and their families in the past year. Food banks, and their army of volunteers, offer a vital lifeline to those in need. But they are a sign of fundamental failure and they should not become an ever-growing feature of life in twenty-first century Britain. Food bank use surges during the school holidays. Why? Because many children receive school meals during term time, but during the holidays they do not. For too many children (around 3 million), school meals are all that stands between them and the risk of an empty stomach. At about 11:30 children start going to the classroom door because they can smell the school lunch and are hungry. They can’t wait to get into the main hall to eat. We have to ask them to sit down and wait. It’s heartbreaking. For many, a combination of unemployment, low pay and wages that aren’t rising, zero-hour contracts and soaring cost of living (especially housing) means they are living on the breadline. The lowest paid continue to be squeezed. Six in ten people in poverty live in households where someone is in work, showing that for many people work is not yet a route out of poverty. People need to be able to earn a wage which allows them to be able to afford to eat healthy food. Governments, employers and businesses need to ensure that work pays. That means decent jobs with decent wages for everyone, giving them the chance to work their way out of poverty. I work—two jobs—and my husband works full-time. We should be able to afford good, nutritious food. We should be able to afford food. The reality, though, is multiple days when dinner has been a tin of chopped tomatoes, some Tesco Value dried mixed herbs, and 20p pasta; we have to regularly feed our family on around £1.50 for the entire meal—not per head. By the time our rent is paid, money put on the gas and electric keys, the bills paid…there’s nothing left. We drink water, we eat the cheapest food, but we struggle to afford even that. In the past decade, food, housing and fuel costs have increased much more quickly than salaries. These increases have affected poor households the most, as they are already spending a greater proportion of their income on basic necessities. The result can be food poverty for low-income households, especially as food tends to be the most flexible item in a household budget. A client came to see me. He lived in a council rented property which was a high-rise flat. He told me that he either could afford to pay for credit on his electric meter or he could buy food. He told me that he couldn’t do both. The client told me that he suffers from arthritis and that the cold affected him greatly. He had to sit under a duvet in an attempt to stay warm. The welfare system is supposed to act as a safety net that can catch people who have become sick, disabled or unemployed, or who are suffering a financial shock or crisis. The system should not leave anyone penniless, hungry or at risk of destitution. And yet the Trussel Trust (the UK’s largest network of foodbanks) reports that a large proportion of their users are receiving benefits or waiting for their benefits to be paid. In fact, in places where the new universal credit system was rolled out, six months later food bank use shot up by an average of 30%. It seems that being enrolled in the social security system is no guarantee of being able to afford to eat. It’s nice there are people out there who help. But I think the welfare reforms are horrendous especially when you’ve worked in the past and paid taxes. When you have a child and you can’t work the government should really help you more than they do. They just give you a bit and say “Right, live on that.” It’s not possible to live on it! 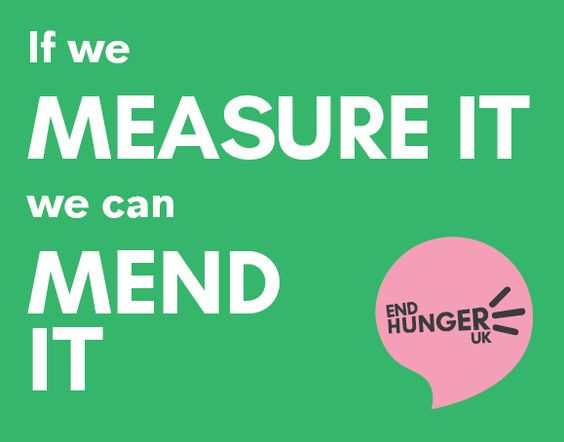 The End Hunger UK campaign has created a Menu to End Hunger which has nine recommendations. One of these recommendations is for our government to take the bold and vital step of regularly measuring ‘household food insecurity’, or hidden hunger. Why? Because, in order to tackle UK Hunger we need the government to lead on some radical policy changes. And radical policy change cannot happen without hard facts and evidence to justify them. 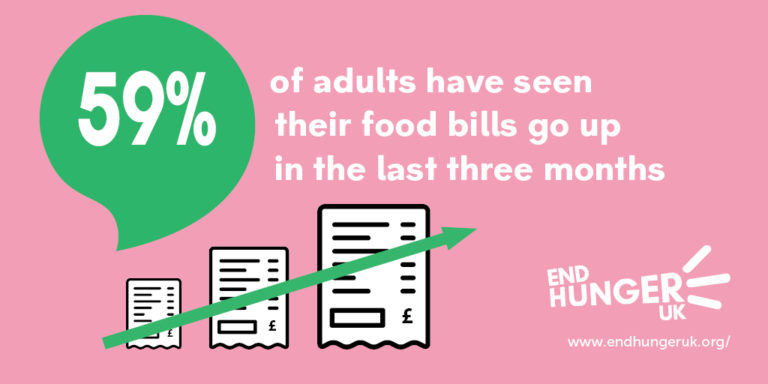 We are amazed the government is not already measuring UK Hunger. You can add your voices to this campaign by entering this poetry challenge. Selected poems will be given a platform during a touring exhibition that will culminate in Westminster in October 2018. Winners’ voices will be heard by MPs and have the chance to make real change. We want you to write a poem or spoken word piece in direct response to this information about hunger in the UK, not exceeding 40 lines (excluding title, line breaks, epigraph etc.) or two minutes. You could write about Hunger in the UK by describing an individual’s thoughts and experiences, perhaps through a ballad, as in Charles Causley’s classic poem ‘Timothy Winters’. You might also want to look at the previous Young Poets Network challenge for more information about Causley’s poem, the Welfare State, and to read contemporary responses written by young poets. Another good poem to look at is Enshia Li’s Foyle Young Poets of the Year Award-winning poem, ‘unwritten letter from my great-grandmother to my great-grandfather, 1930’, about famine during the Chinese Civil War. You could write polemical verse describing your feelings about the system and the people who allow social injustice to happen. Watch Benjamin Zephaniah’s classic poem ‘Money’. He explores all the different facets of money. Could you explore a word or concept in this way? He uses repetition, rhythm and rhyme to hammer home his message: money makes people unequal. How can you use these techniques to reinforce your message? Will you perform your poem instead of writing it down and sending it in? The winners of this challenge will participate in a performance masterclass and perform their poems to camera: those films will then be included in the End Hunger UK’s touring exhibition. If you’ve ever wanted to give spoken word a go, now’s the perfect time! Get more inspiration from poems Shave The Lion by Jan Bradley and Worthless by Agnes Török. You could extend the lines of your imaginings beyond the scope of reality, for example in this poem about the Privatisation of Air by Paul Lester. 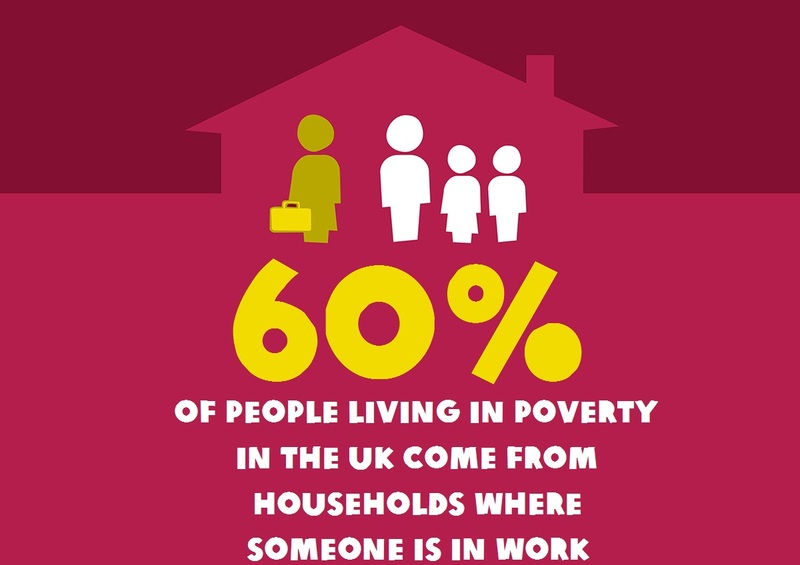 The statistics that we’ve seen in this challenge have been pretty baffling – more than half of everyone in poverty live in households where someone is in employment. The UK is one of the richest countries in the world. What surreal images could you use to talk about UK Hunger? Or you probably have your own totally unique way of approaching this – feel free to use your own words and ideas to express yourself on this topic. But remember to listen. Be careful not to over-simplify or patronise. It’s important not to imagine people in groups, but as individuals, and to do this you have to listen to their voices first. So read back over the testimonials we’ve included in this challenge, and go and do your own research – find some blogs (like this one) or an online article (like this one) where you can engage with people and do some good listening before putting pen to paper. Selected poets from each age category will be published on Young Poets Network and sent an exclusive Young Poets Network notebook as well as some goodies from the End Hunger UK campaign. Poems will be judged by a representative from The Poetry Society and Casia Wiliam Children’s Poet Laureate for Wales (Bardd Plant Cymru) on behalf of End Hunger UK. Winners from each age category will be invited to London on Saturday 26 May for a specialist poetry performance masterclass and to have your poem professionally filmed. For teachers entering 10 poems or more, your names will be entered into a prize draw for the chance to win a free poet visit to your school. Selected poems will be published and be included at the touring exhibition organised by End Hunger UK in June – October 2018. This is your chance to have your voice heard by MPs and people around the country. What are you waiting for? This challenge is for writers aged 11-25 who currently reside in the UK. Poems will be judged in three age categories: 11-15 years, 16-18 years and 19-25 years. The deadline is midnight, Sunday 6 May 2018. You can send a poem written down, or a recording as a video or as an audio file. You can send as many poems as you like. Written poems must not exceed 40 lines and audio/video recordings of poems must not exceed two minutes. Send your poems to educationadmin@poetrysociety.org.uk with your name, date of birth/age, gender, and the county (or, if you’re not from the UK, the country) you live in and the subject line ‘End Hunger UK challenge’. If you are aged 11-12 on 6 May 2018, you will need to ask a parent/guardian to complete this permission form; otherwise, unfortunately we cannot consider your entry. This is due to new data protection laws. By entering, you give permission for Young Poets Network, The Poetry Society and members of the campaign to End Hunger UK (listed here) to reproduce your poem in print and online in perpetuity, though copyright remains with you. You also understand and agree to be invited to a performance skills masterclass and be filmed on Saturday 26 May 2018 if your poem is selected. We will select one winning entry per age category, as well as several highly commended poems. If your poem is selected we will seek your permission to share it publicly and the permission of a parent/guardian if you are under 18. Please do be sure to check through the general Terms and Conditions for YPN challenges as well. We welcome entries from whole classes of young people submitted by their teacher. We hope teachers will use and adapt the stimulus above to enable young people to create some really fantastic poems. Please see more teaching resources here. Please send us this class entry form along with your students’ poems. Please find our safeguarding policy for this challenge here. Young Poets Network have worked with End Hunger UK to bring you this poetry challenge through its partnership with Oxfam, one of the lead coalition members. We’re so pleased to hear that! We hope to read a poem by you soon. My poem is 47 lines after a lot of cutting down. Is there any way that I could still send it in? Or will that disqualify it? Thanks for your comment. Unfortunately in this particular challenge we cannot accept poems over 47 lines or 2 minutes if submitted as a video/audio recording. I hope you do submit a poem though! Can non-UK residents submit poems to this particular challenge? Thank you! This challenge is specifically for UK residents – however, our challenge to write a protest poem is open to writers from all over the world! Can you submit poems as group or give in group work? I’m afraid we can only accept poems with single authors in this challenge. Would everyone in your group be interested in submitting individual poems? We’d love to receive them! When will the winners of the challenge be announced? Thanks for your comment. The winners of the challenge will be announced soon, and we will email all entrants as soon as we have the results.